If you've ever worked a boring booth at a trade show, you've most likely been the victim of the "avoiders." Those passers-by who liken you to Medusa and refuse to look your way for fear of being turned to stone. You notice them by the way they engage actively with booth 1145, take a quick glance at your booth with that lonely poster and brochure, and then, hurriedly walk past you with their eyes carefully averted. After enough of these avoiders, you may start to wish you had some of those smiley-faced, squishy stress-balls to throw at them. This year, with some careful planning and a little creativity, you may be able to grab people's attention and keep them engaged without resorting to assault and battery. Obviously, the lengths that you go to create interest at your booth may be limited by your budget, so it's important to think about what this trade show means to your business and how engaging 10, 50, or even 1000 target individuals may bring more work your way in the coming months. Once you've got your budget ironed out, you can start getting those creative juices flowing. o	Superhero or celebrity photo ops. Invent a superhero to represent your company and have him or her available for photo opportunities with booth guests. It may seem a bit corny, but it works. The same is true for celebrity look-alikes. Be sure to get their card so you can send them the pic after the show. o	Wheel of Fortune. Nothing screams "come here now" than the chance to win fabulous and exciting merchandise (or your services). o	Create a treasure map leading to your booth. 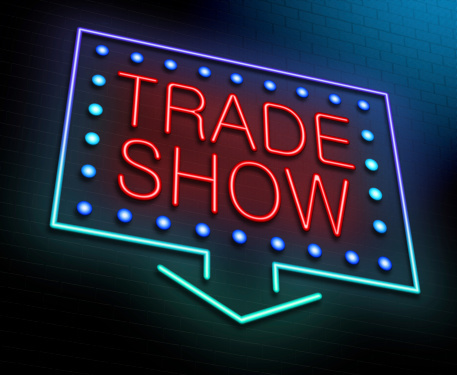 This may require some cooperation on the part of the venue, but placing arrows or words on the floor that lead people to your booth can create intrigue and bring people in. Whatever you decide, make it fun and interactive. Think Disneyland for adults. Regardless of what genius idea has emerged from your mind, it's important to create a sense of anticipation among your clients and prospects. Sending out formal printed invites or periodic emails revealing a little something more about what's in store for them when they visit will get them chomping at the bit to visit your booth. You get very few chances to make an impression once you get people into your booth. Once they're there, make your efforts count by providing them with unique, high-quality informational products that will not just stay in the bag in the closet when they get home. Hopefully, your venue will provide a mailing list of all of the participants so you can send out follow-up correspondence to those you saw and those you missed. If no list is provided, be absolutely sure you get business cards from the people you talk to and connect with them ASAP! The more opportunities you have to make an impression, the better.